I have some new releases that you may like, a new set called, “Vintage Thrift Store” because the style reminds me of something you might find rummaging around in a bin at the Thrift store. Two new bangles & earrings sets! First off – the “Delicate Drama” set and then the, “Black & White Revisited” set. Both started as experiments in something else which led me down a different path. And finally, new hair, Kana, a loose messy bun with lots of fly-away bits. 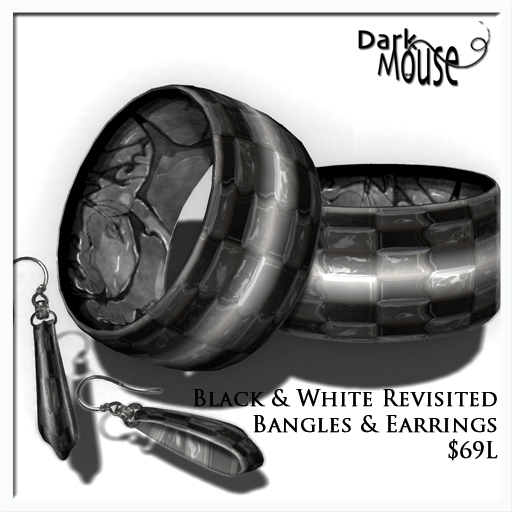 All available today at Dark Mouse Jewelry & Hair, I hope you take a minute to stop by my newly rebuilt store – here’s an LM! Sadly, another event for a disaster, what you can do to help – plus, a special offer from me. Sadly, there is another disaster to contemplate, another disaster to send your prayers, thoughts, and if you can, your assistance. There was an 8.9 earthquake in Japan on Friday, and they are just now seeing the scope of the devastation. People lives have been lost, and the survivors will need all our help. I’m participating in a the Pacific Crisis fundraiser, an event to raise what will be much needed dollars to help out those affected by the earthquake in Japan. Go, donate. Here’s a picture of the jewelry I will be offering as a donation sale. It’s call the Anzac set, available in gold, silver or copper. Click this link to teleport to the event. ALSO – if you make just a donation to the donation box available at my main store on the Amira sim, I plan to DOUBLE the amount. At the moment, there is 5300 linden in the box (A very lovely person made a big donation). So if you’d like to make a donation that way, please drop by. You have till the end of the event (April 10) to donate! Here’s a direct slurl to my store if you’d like to donate that way. Hump Day! 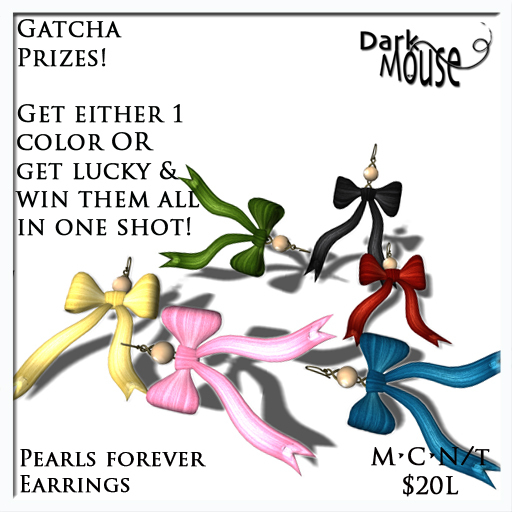 Visit Dark Mouse for $69L Happiness! Oh yes, in order to get you to come and look at my new store, I’m offering this tantalizing special for Hump Day Happiness! 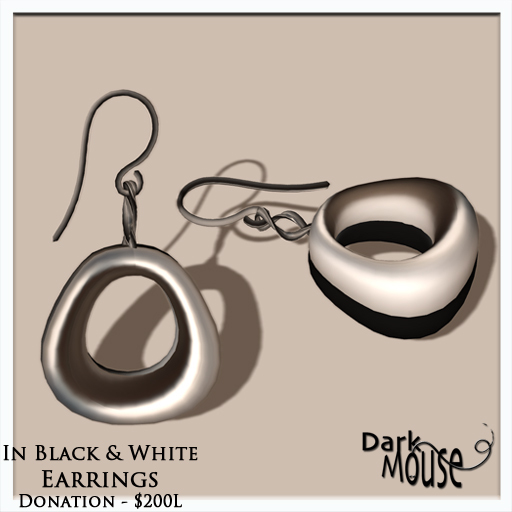 My own bangles I’m calling, Black & White Revisited, with matching earrings. Only $69L. You can’t beat this deal with a stick. Well you could, but then things would get messy! Here’s a teleport to the store. Be sure to visit all the fabulous HDH Vendors! 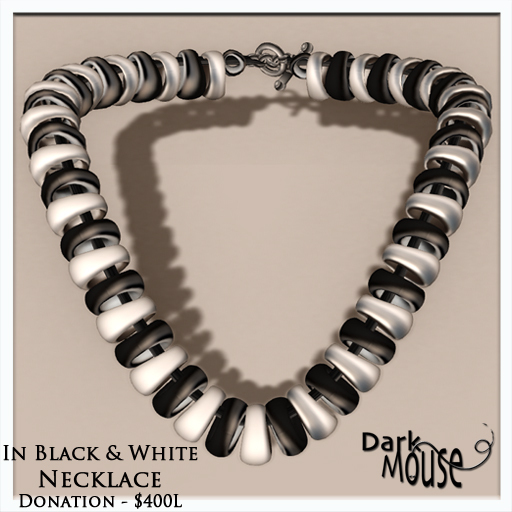 Dark Mouse at Fashion for Life! Hi there, I’ll be participating in RFL’s Fashion for Life event – and will be releasing a new set that I’m rather proud of for the event. It’s called ‘In Black & White” actually I like working in black and white tones, it really sings to me somehow. I hope that everyone likes it, goes to the show, and spends lots of money on FFL items! All for a good cause. 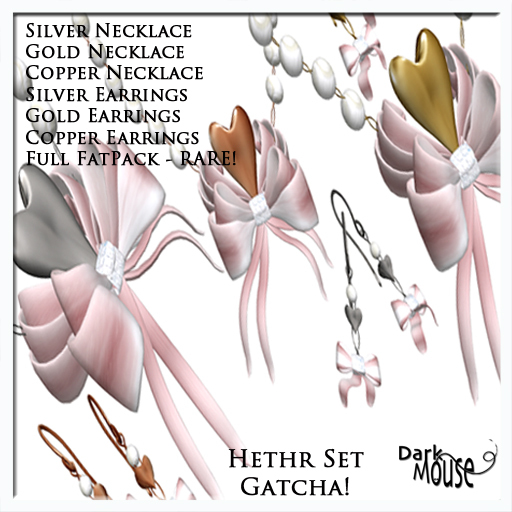 I’ll have a gatcha item too, really fun the Hethr set. Here’s where you can find me at the event. I missed the last couple of weeks of hump day, but will have an entry this week. I hope you enjoy – my thrift store bangles, kind of like the things you’d find in an old tray of jewelry (my personal favorite kind of thing). These bracelets will eventually be part of a full set – but I think they are pretty cute and hope you will enjoy. 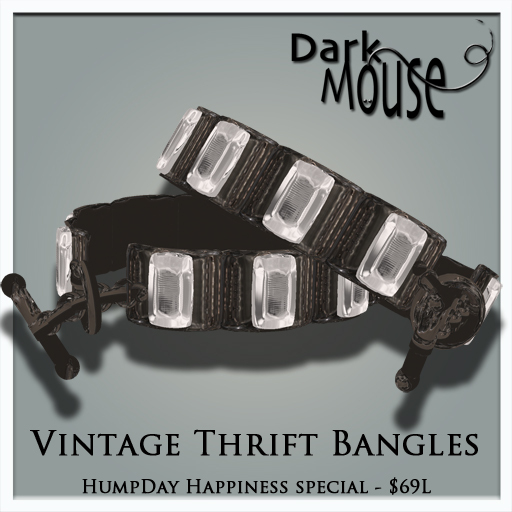 Only $69L for Hump Day Happiness at Dark Mouse – Here’s a teleport directly to the store. And be sure to check out the lovely merchandise from the other Hump Day merchants! OH and you can now get the run down of Hump Day participants – with pics on the SCD blog! Also – if you have not noticed yet – I’m in the process of rebuilding my store – which means I need to clear out some older stuff – there are full sets at only $50L and fatpacks of stuff at only $100L. All my bags are on clearance for $25L. 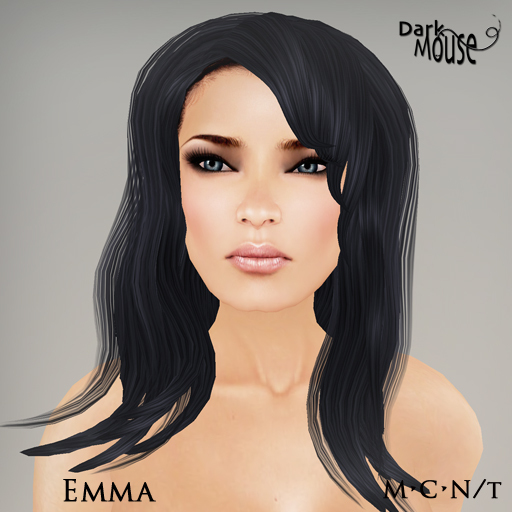 Last but not least – I hope you’re in my Dark Mouse VIP inworld group. 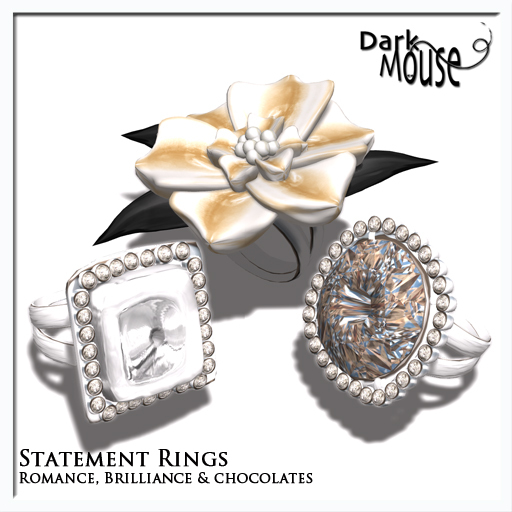 I’ve just sent out the loveliest group gift – exclusive for Dark Mouse group members only. The sweet hanging rose necklace will never be for sale. Enjoy!